Thank you for choosing Creately Desktop. We trust you will enjoy the feature-rich ability of this app, which is designed to offer you the best of two worlds. 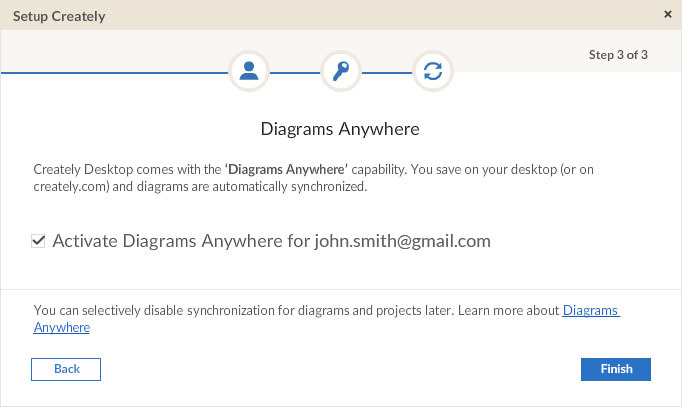 To discover a new diagramming experience that’s awesome, all you got to do is install it now. Here's a step-by-step guide on how to install Creately Desktop on your machine. Creately Desktop uses Adobe AIR to bring this web-based app to your desktop. Installing the desktop version of Creately will take a few minutes; and by doing this you are agreeing to be bound by the Creately Desktop End User License Agreement (EULA). If you don't have Adobe AIR already installed in your machine, you can get it from here. 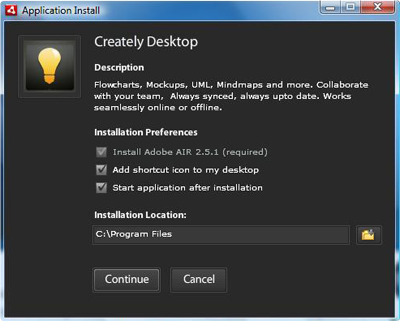 Or when downloading Creately Desktop, Adobe AIR will install automatically as well. To begin installation, just click Yes. 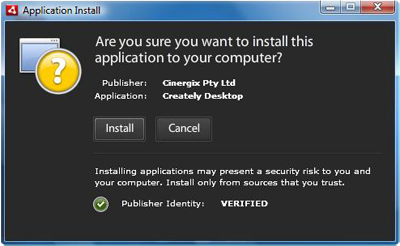 Once the application is ready to be installed on the Desktop, you'll be prompted to confirm your action. You can then click Install to continue with the installation process. You can then choose your Installation Preferences ('Install Adobe AIR 2.5.1' will be ticked by default); select the Installation Location and click Continue. Review and click on the I Agree button to acknowledge the terms of the license agreement. Now, your Creately Desktop will begin to install. 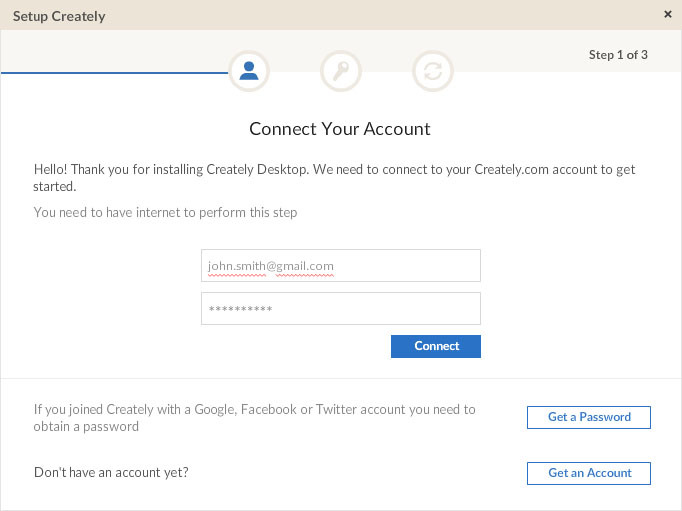 - You can now setup Creately Desktop by connecting to your creately.com account. But, if you're a new user you can get a new creately.com account by clicking on Get an Account. - Your Creately Desktop license key will be e-mailed to you. 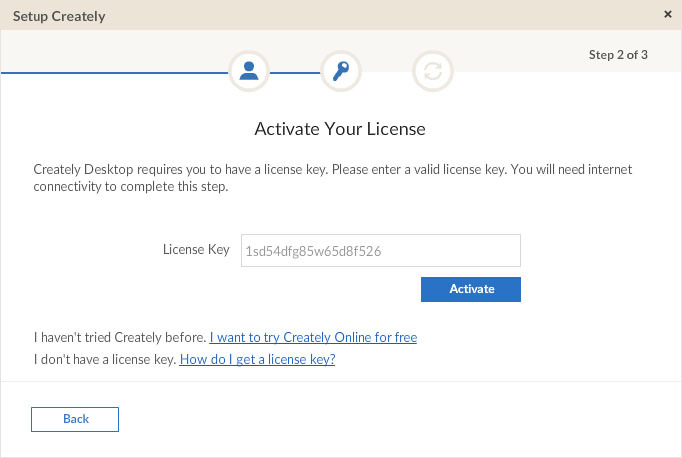 You have to use that license key to Activate your Desktop License. Note - You'll need a valid license key to use Creately Desktop. - Enable the Diagrams Anywhere feature to have all the diagrams that you created on creately.com and the desktop app to be sync’ed automatically. If you deselected the last option from Step 3 - then you can then click Finish to complete the installation right after Step 5. In order to start the app, you can then go through the Creately setup as explained in Step 6. How do I install Creately Desktop?